Sunset Bungalows is by the sea at Marae ('Mah-rye') village. Tankyu tumas Rob for telling us about Sunset Bungalows. 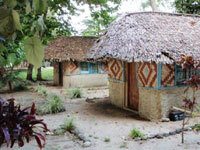 Marae Sunset has two traditional style bungalows (each sleeps four singles). There is a large, separate dining room and an outdoor dining area with loungers to watch the sunset. Trips to Cook's Reef can be arranged. 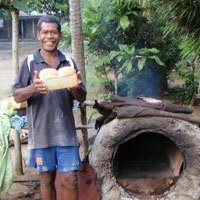 You may contact Jimmy Kalo on mobile +678 5691407. First surveyed: 2014 by Rob. Last updated: October 2014 by Rob. I stayed here in Jan 2014 for a week. It on the edge of Marae village next to the beach in a shady location next to the trees. The bungalows are local style and there is a large outdoor dining table and fibreglass sun loungers to relax and watch the sun set. 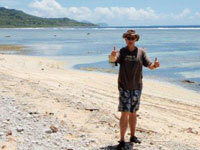 As in most places in Vanuatu the people are awesome and friendly and food and hospitality superb. 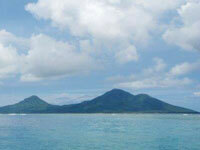 The island has few visitors and is great for walking on the vehicle tracks and along the beaches. Jimmy and his family will look after you very well. Rob NZ. Please read our DISCLAIMER notice. COPYRIGHT © 2004-2009 Wantok Environment Centre (WTEC). All rights reserved.